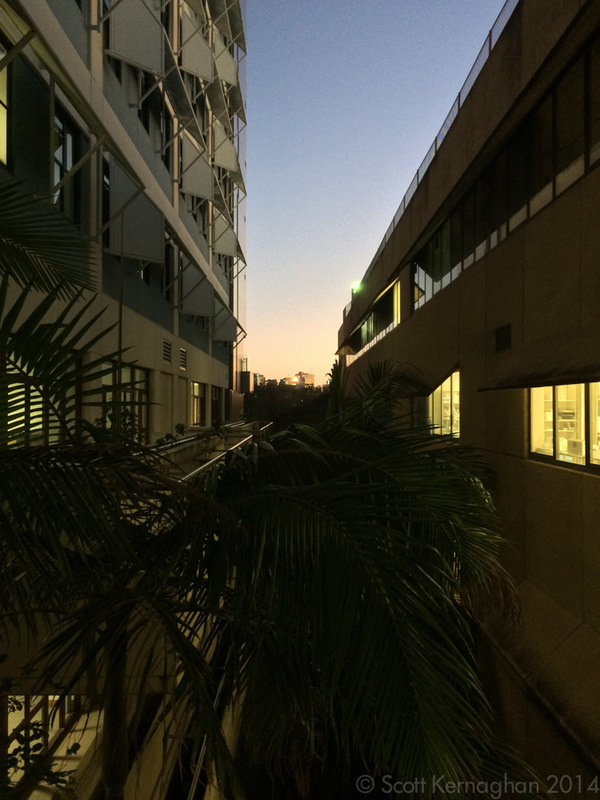 This photo shows most of the older buildings that made up the RCH campus. The main hospital is to the right. This year I’ve made some fairly dramatic moves in my life. Along with moving back interstate to my former home town of Melbourne, I also quit working at the Royal Children’s Hospital in Brisbane where I had worked for the previous 5 years. 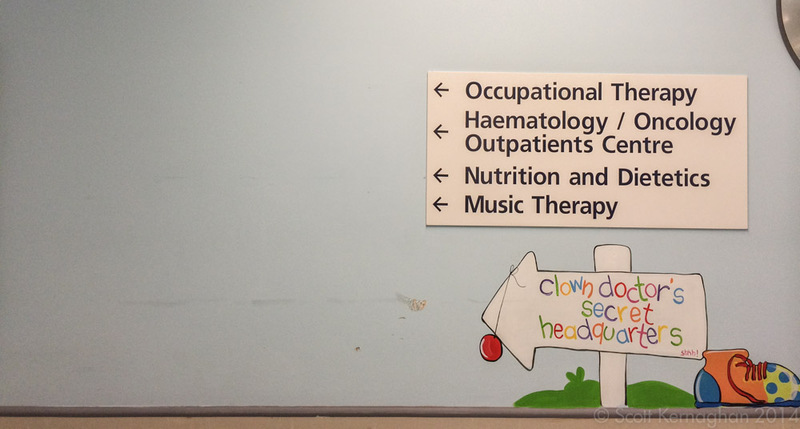 However it wasn’t just myself that left the RCH – everyone did this year. The hospital closed its doors in November after operating on the Herston road site for over a 120 years. 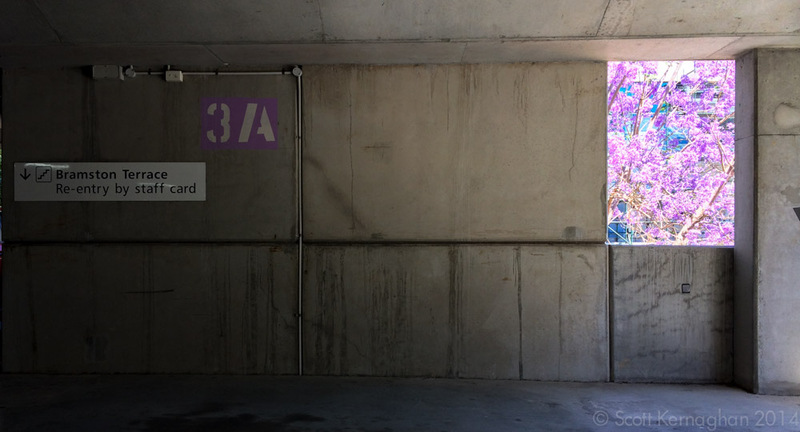 Late 2013, knowing that myself and Miss Jane were soon to finish working at the hospital, I started to take photos of much of the structure and the artwork inside of it. I often worked what was called a ‘pager duty’ shift – a shift that required me to walk around with a pager, where I could be called upon to fill a staffing gap in any department that needed someone urgently in the evenings. 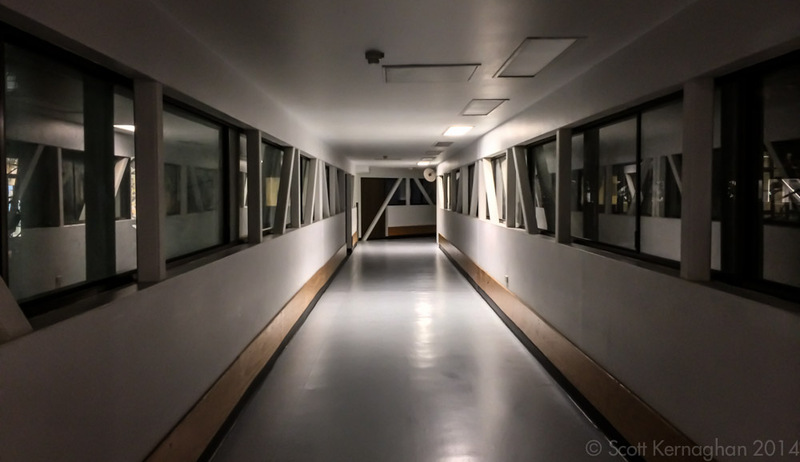 Occasionally when I had a moment where I wasn’t madly running between wards, I would stop and try and get some photos of the hospital at night, while the hallways were clear and patients wouldn’t lurk into my photos (and thus violating their right to privacy). 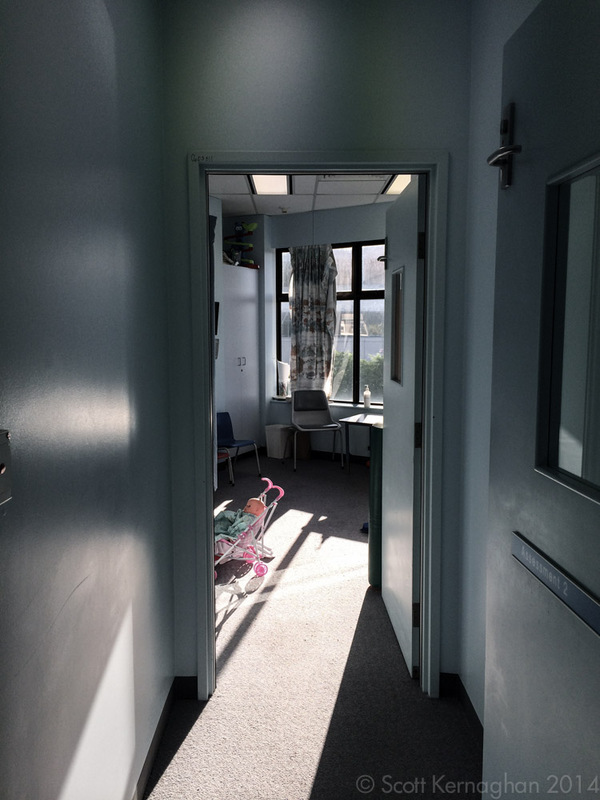 When the RCH closed in November it was a bitter-sweet moment for Miss Jane and I. Both of us had spent countless hours heavily involved in the transition planning to the newly constructed hospital. And while both of us had quit months before we, both still felt sad that we weren’t there to see the transition through. Jane had been part of the planning and design of the new hospital, with her infection control expertise, while I had conducted the furniture, fittings and equipment auditing that provided a foundation for the hospital to plan what equipment we needed to still buy, along with what could be transported to the new campus. Both of us had devoted many hours to this planning process. The art of the RCH. Over the years the Children’s Hospital progressively developed into an environment that was designed to be more welcoming to children. 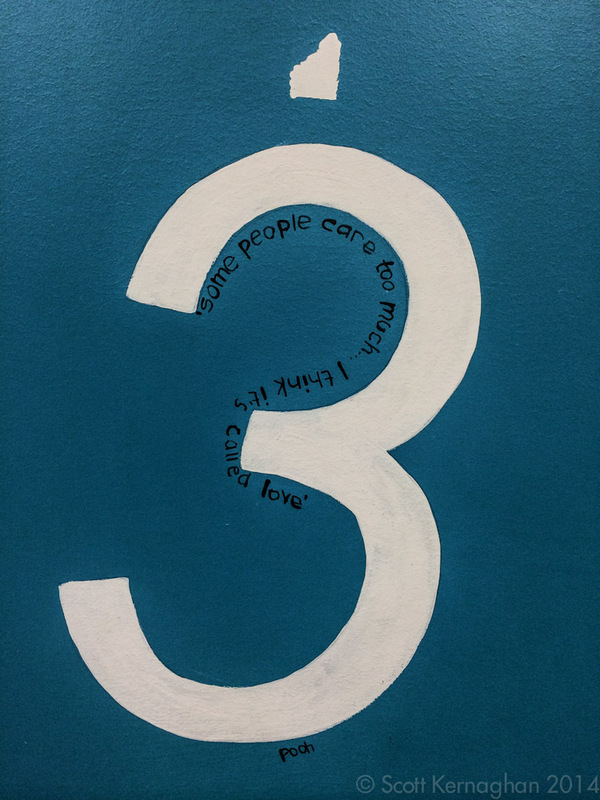 As such almost every wall in the building featured artwork that gave the building a bright and friendly feel. 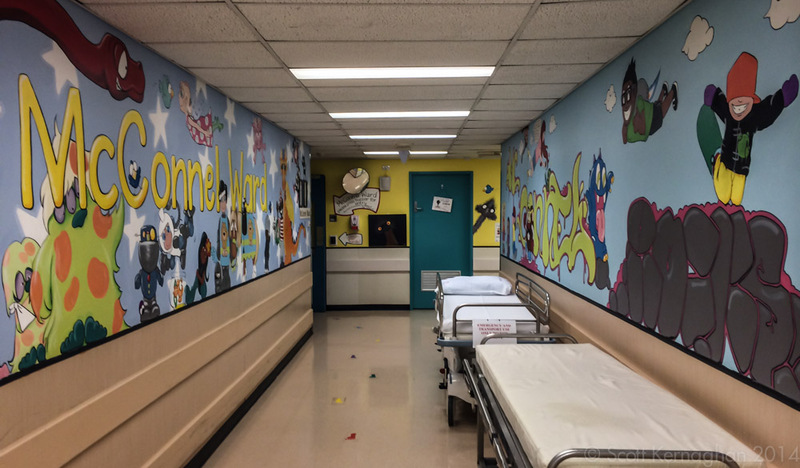 The entry way to many wards were an explosion of colour that often would very young children walking back and forth looking at all the creatures and shapes that could be found on the walls. Most of this was painted by an artist that I often would talk to during breaks. However I only ever knew her name as ‘Belinda’. The rooms themselves were also very decorated, giving children something to look at while they were often trapped for long periods in their beds. 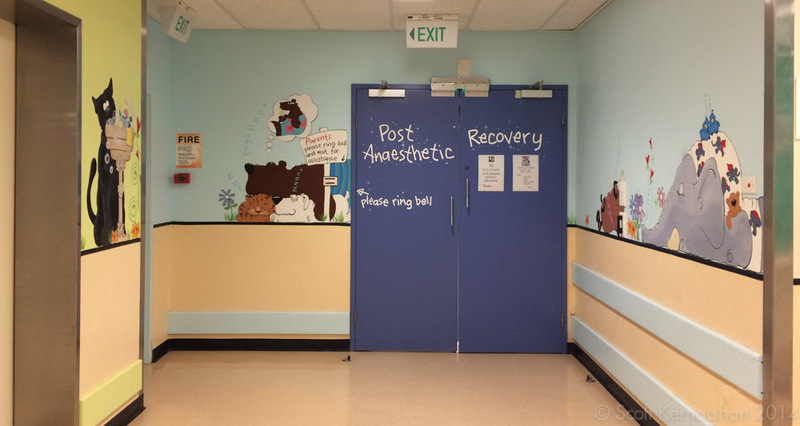 One particular room of is the operating theatre in the emergency department. 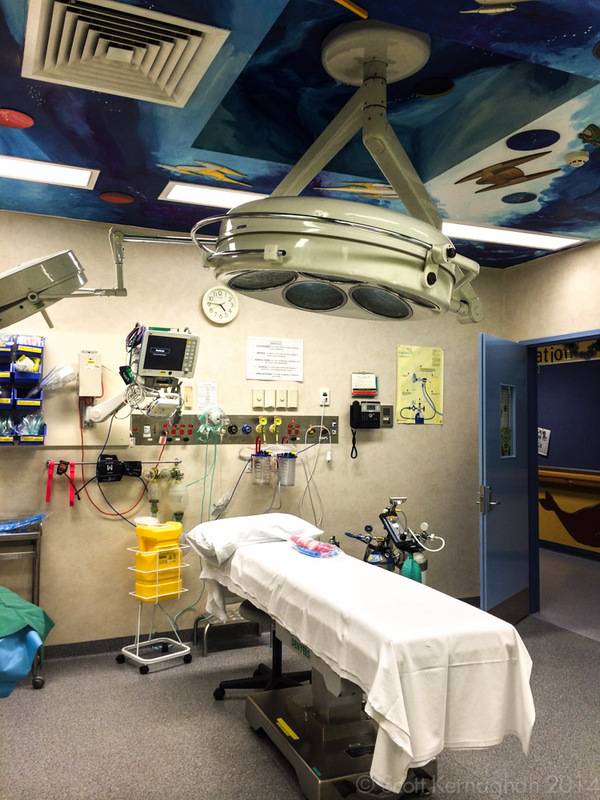 Above the bed where children would be looking while being assessed, sewn up or operated on – the ceiling was decorated with a very elaborate space motif filled with stars, planets and flying space-ships. 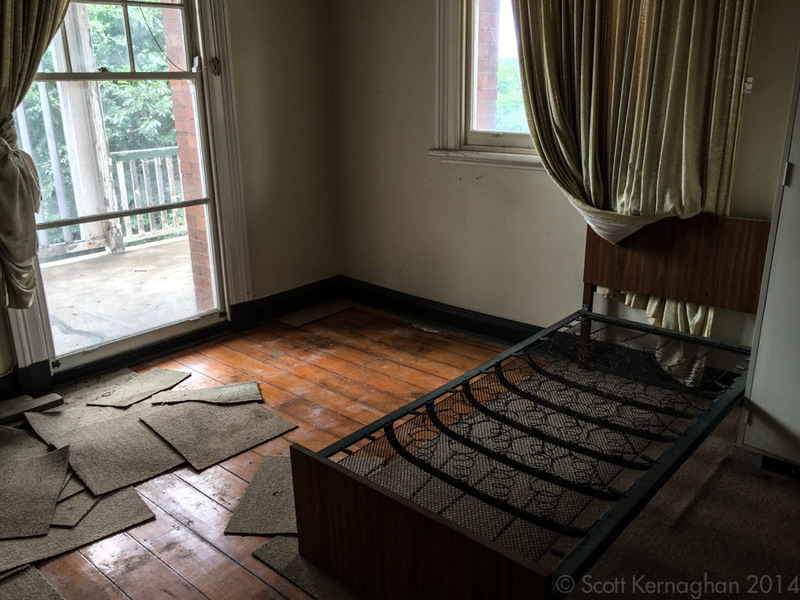 Lives were saved in this room, and I often think about the children that nodded off to sleep under aesthetic while dreaming of adventures in outer-space. 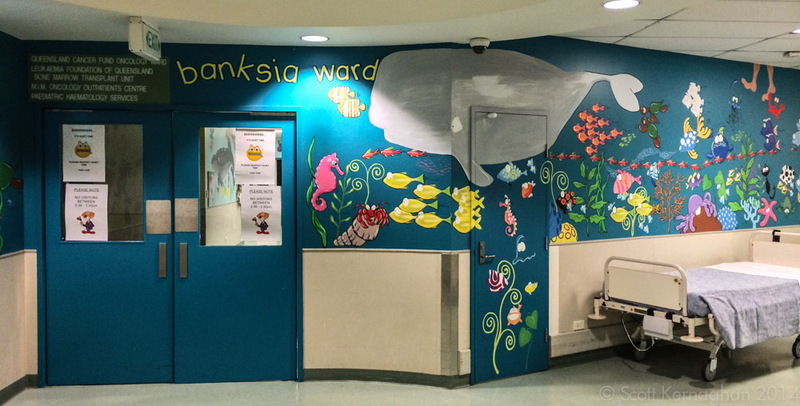 When I was first interviewed for my position at the RCH I was told to find the office by heading to the hallway on the third floor of the surgical building, where I was to “look for the green dragon”. The door to the office was directly opposite it. 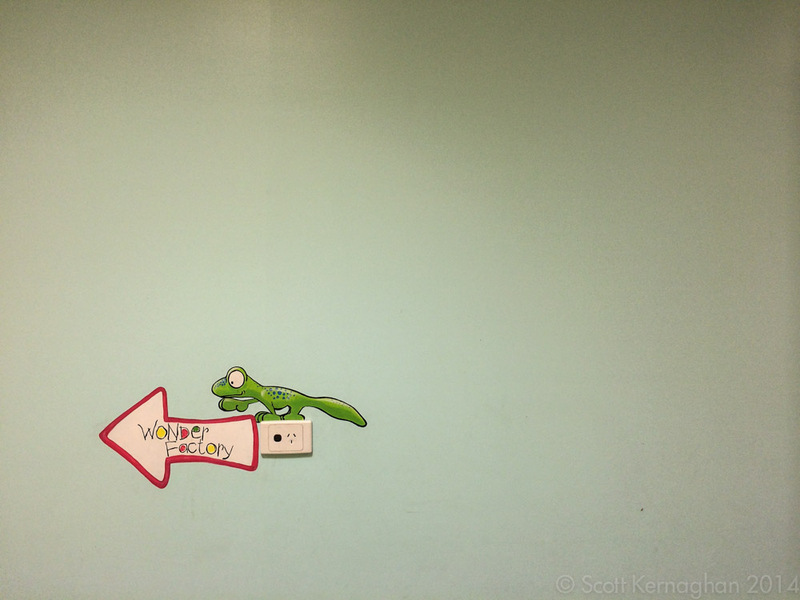 A lot of the artwork around the hallways became landmarks, and many of them were intentionally designed as such. When one department moved their office to the floor above their original location, they stuck an artificial snow-man out the front of their door so that people could find them easily. Every week they dressed the snow-man differently – sometimes as a construction worker, other times as an angel. Sometimes little pieces of art were just left around the place as items to discover if you looked hard enough. n.files.wordpress.com/2014/12/theydbedragons.jpg”> Ah! The dragon that started it all for me. For the vast amount of time I worked at the Royal Children’s I worked in children’s oncology, or in a position that worked closely with the oncology patients and their families. However I also relieved in positions in other areas – amounting to an impressive amount of experience in all but 1 of the hospital’s major departments. I also worked in some interesting and crucial smaller areas such as the hospital’s consumables and equipment department, and surgical theatre bookings. However one of the more unusual jobs I performed while I worked there was to undertake the ‘Pager duty’ role. The job started late in the afternoon, and went to quite late at night. 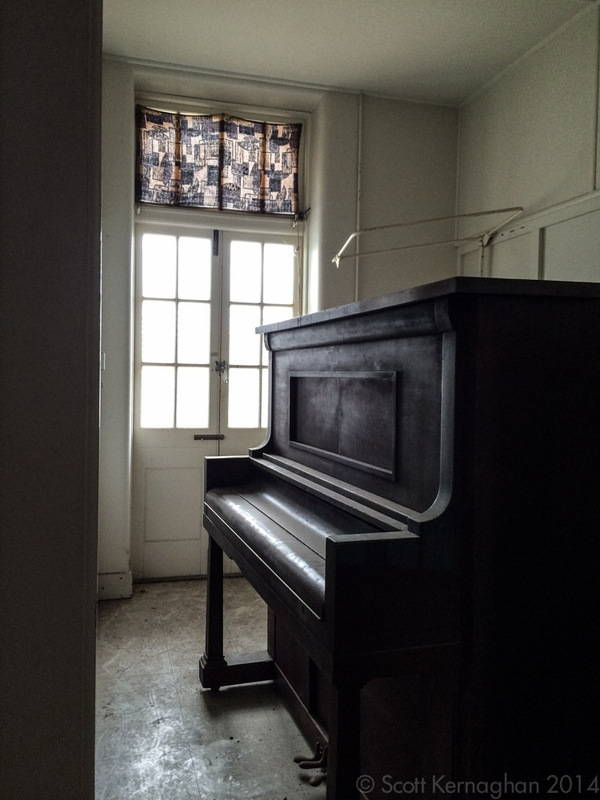 As such I would often find myself wandering hallways that were usually full of patients and families but were now in eerie silence and darkness, to perform work that could amount to almost anything. One of the core roles of the position was to properly mix baby formula for incoming babies and children. During the day we had an entire department that made up the feeds for the inpatients, however at night unexpected drop-ins would arrive, and require feeding. And for those who have mixed up baby formula for your own children and think this would be easy, I’d hate to bust your bubble, but hospitals have far more exacting standards than you’d expect, and this job was never just simple. s.com/2014/12/formula.jpg”> The great catalogue of formula. More cans were kept under the counter. [/caption]The thousands of possible formula mixes were catalogued on tables on the wall, and we had to make the mixtures up with sterilised equipment, measured to exacting weights. Water was boiled and then stored refrigerated to avoid contamination. I had to ‘gown up’ with every new batch made, and wash everything down extensively. There was nothing particularly easy or casual about the whole process. Everything was then kept track of in a ledger which had been running since 1998. I was surprised to see the book still intact and in use when I left in 2014. Although it was on its last page, freakily finishing the entire book just in time for the new hospital, a cool 16 years after it started. 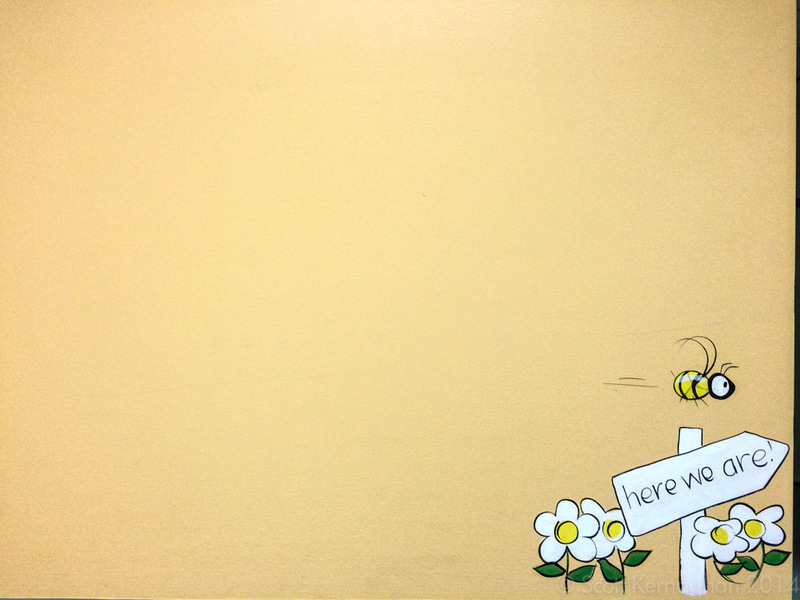 2014/12/formulabook.jpg”> Gosh. The amount of records I put in this book. And yet it never fell apart on me! [/caption]And then there were the hallways… Dark, foreboding spaces that at precisely 9pm every night became even creepier, as you could hear the automatic doors along the hallways close and lock themselves down for the night – as though ghosts were shutting up shop for us. 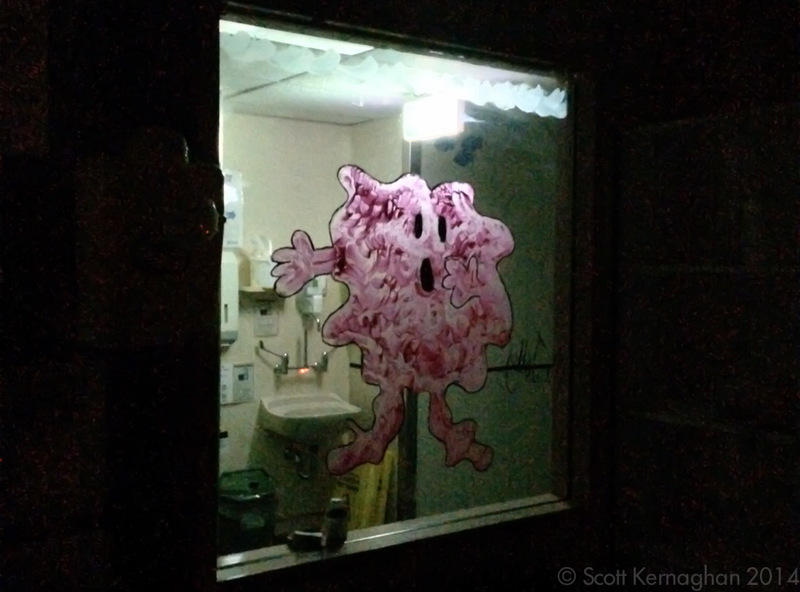 No matter where you walked, even at night, there was always something that showed signs of people and patients having been there, and the children that we cared for. Some of the buildings in the hospital dated from the turn of the 20th century, while others were less than 20 years old. That said, things grew and changed over time, and most places took on a life and a character of their own. 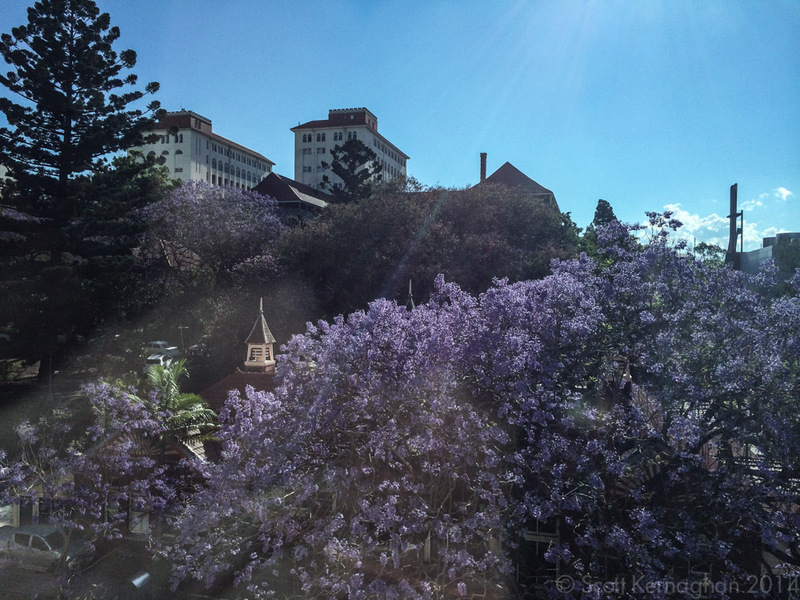 One of my favourite places to hang out would have had to have been the Oncology staff tea room, which had an incredible sweeping view the city centre of Brisbane. 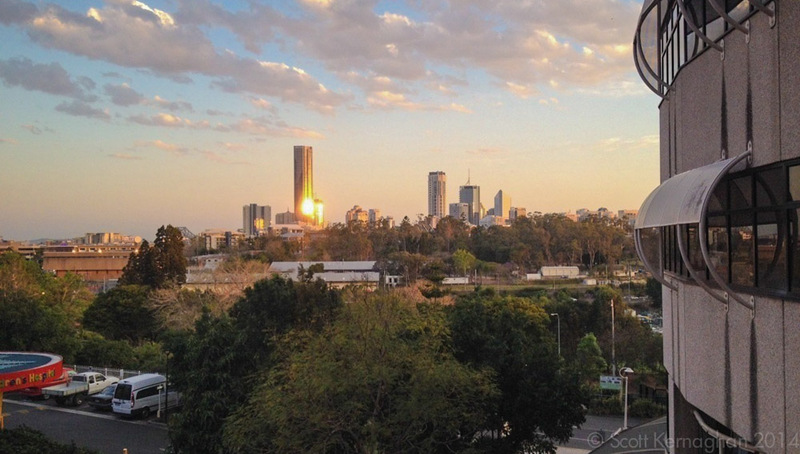 Often while working on an evening shift at the hospital I would find myself in there at break time, just enjoying the view of the city as the sun set. 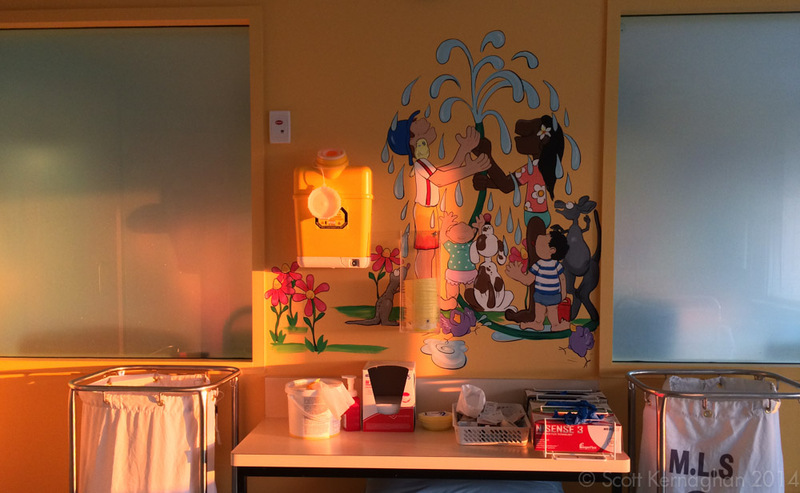 There were many little spots of unexpected beauty to be found just like this in the hospital. However, while there’s beauty to the buildings, there was always life inside of them. Many of the wards often seemed to be a mad-house of activity, and rooms were frequently too packed to move around. 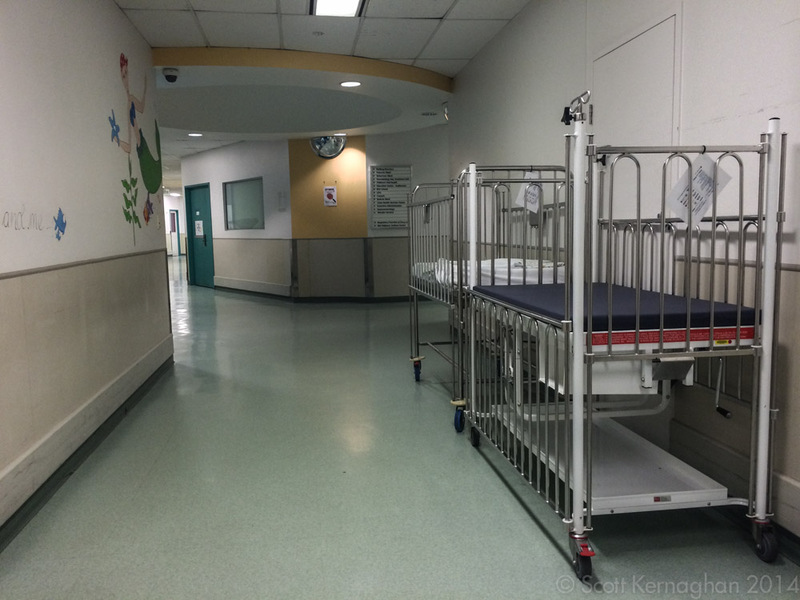 The cots in the next photo are a reminder of the core business of the hospital. These cots were always waiting just outside the door of the oncology ward, in case one of the our younger patients needed to come in. We looked after children with auto-immune and haematology conditions as well, trying as best we could to give them as good a start in life as possible. 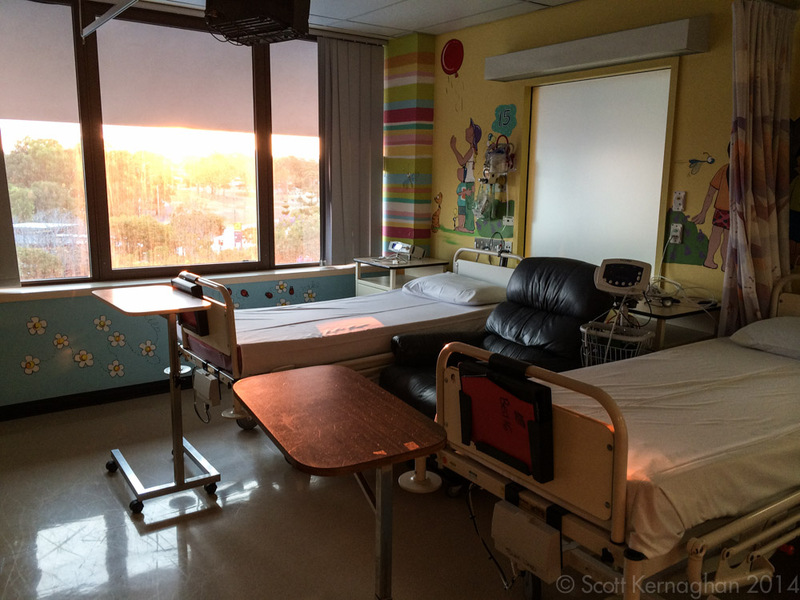 In a lot of ways this next photo is exactly how I would want to think of how the children’s hospital is now. The empty beds left idle after successful treatment, and all the children home with their families – everyone cared for and cured. When things come to a close. 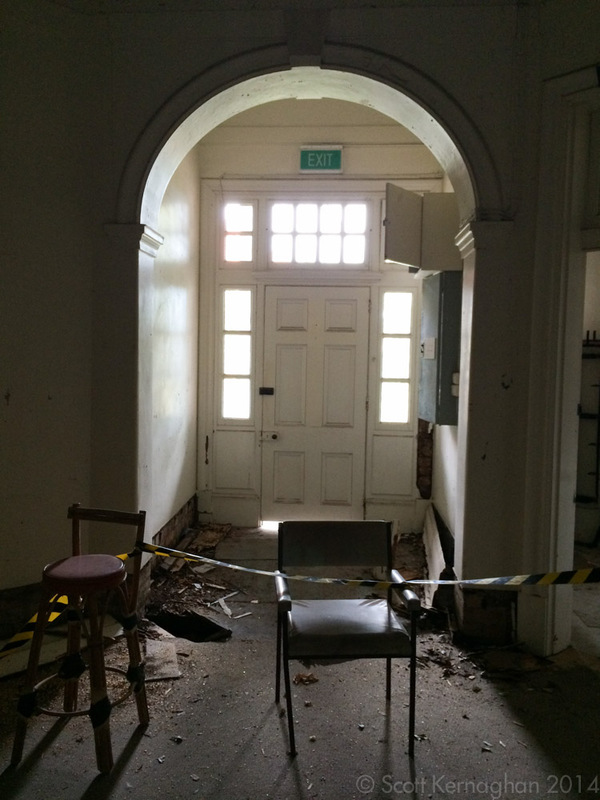 With so many ageing buildings at the RCH campus, things began to become very expensive to run and repair. Even some of the newer buildings were having crucial infrastructure failures, and despite much of the emotional attachment people had to the old buildings, it was pretty clear that we needed a new hospital. The second day that I worked in the oncology ward, way back in 2009, a fierce storm hit and lighting struck the the structure on the roof of the hospital. Reportedly the rain was so heavy that the top floor of the building I was in started to take water, and leaks got into our automated fire system. First the fire alarms triggered, and then the emergency lights. 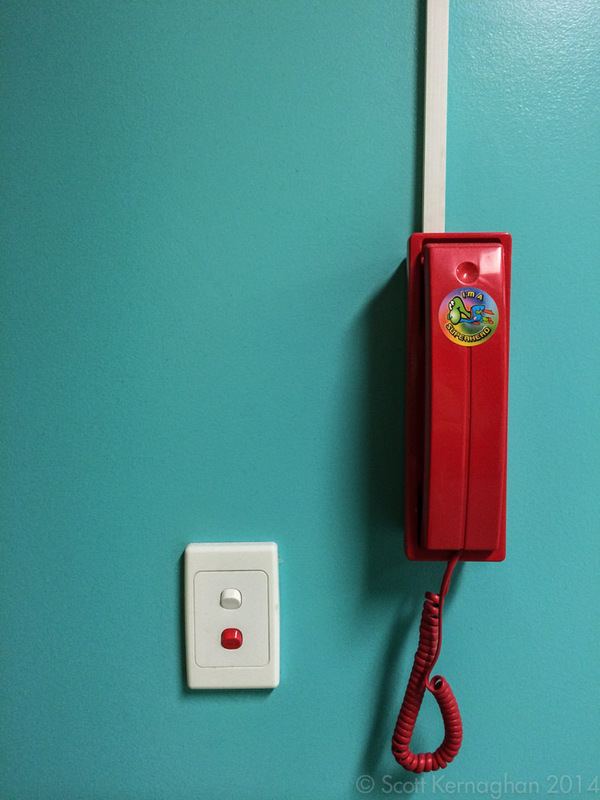 As the regular lighting failed a final alerts system kicked into play – a voice recording of a man saying “Your life is in immediate danger, please vacate the hospital as quickly as possible”. Expecting to be engulfed in flames, many of us quietly browned our underpants. However some of the older staff just simply groaned and told everyone not to worry – after all, this wasn’t the first time this had happened. Sadly this building had been constructed in 1995, and was slowly falling apart. It was falling apart even faster than many of the other buildings that had been on the site for decades. However there was one particularly haunting structure that had been mostly abandoned, which actually was an incredibly beautiful space. 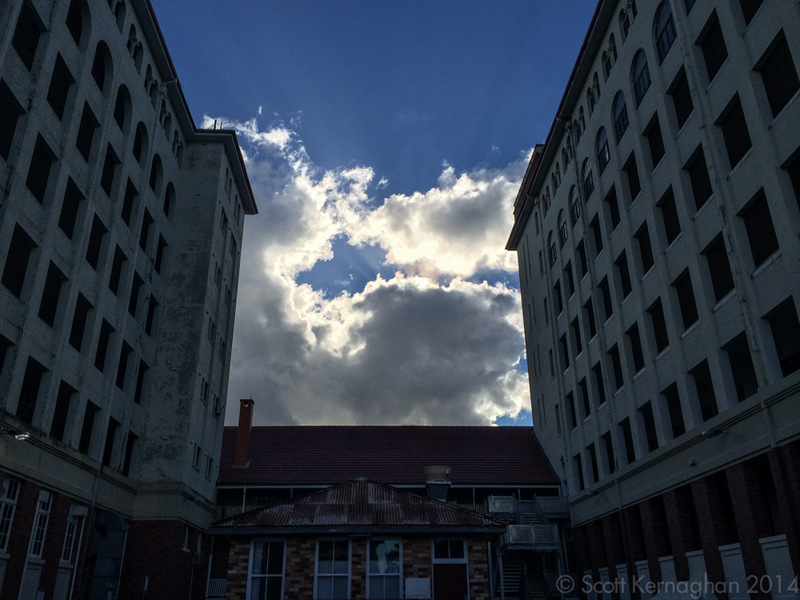 I speak of the disused nurses quarters. The quarters were made up of three buildings – one of which was built at the turn of the century and was several storeys tall. The other two were towers that were known as the ‘north and south towers’, and had been built in the 1930’s. The north and south towers. 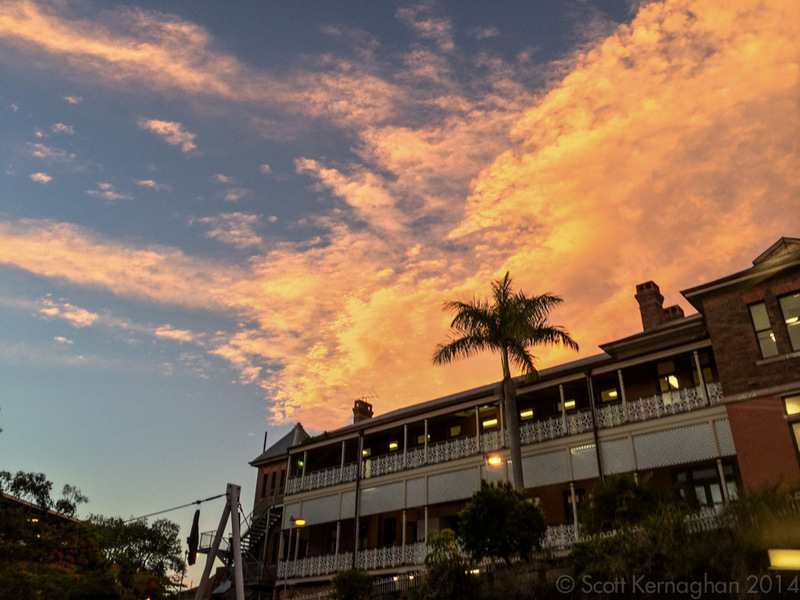 Both of the towers were 8 storeys tall, and until the mid-90’s housed nursing staff that worked at the children’s hospital and the Royal Brisbane Women’s Hospital next door. 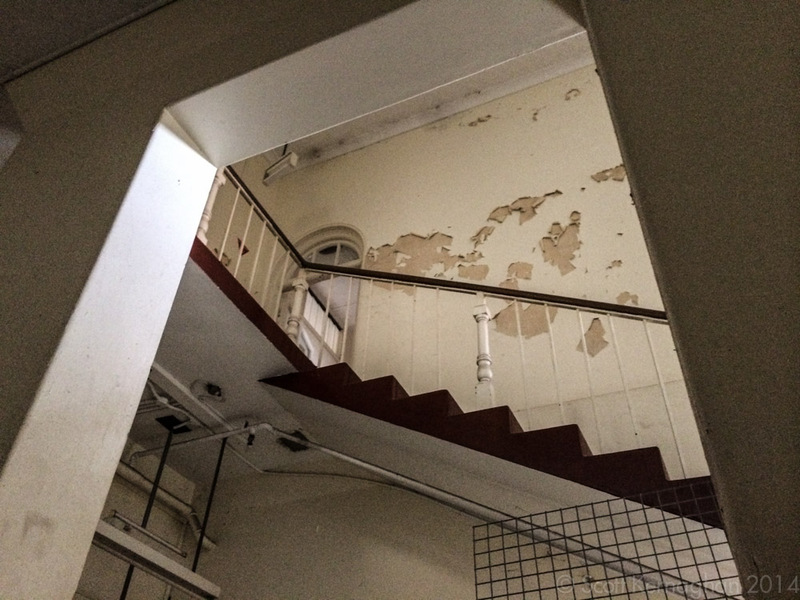 Today the towers remain largely empty except for the bottom couple of floors which were refurbished to allow for extra office space. As such, what remains unused of the buildings has been left to crumble apart. No-where is this more apparent than in the turn of the century building that the two towers lead on to. 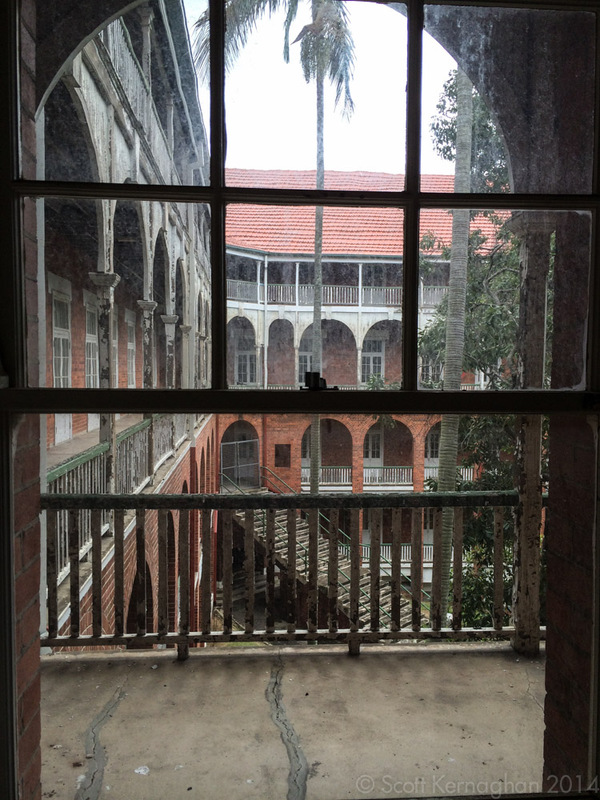 All of these buildings are heritage listed, and one day will be restored. 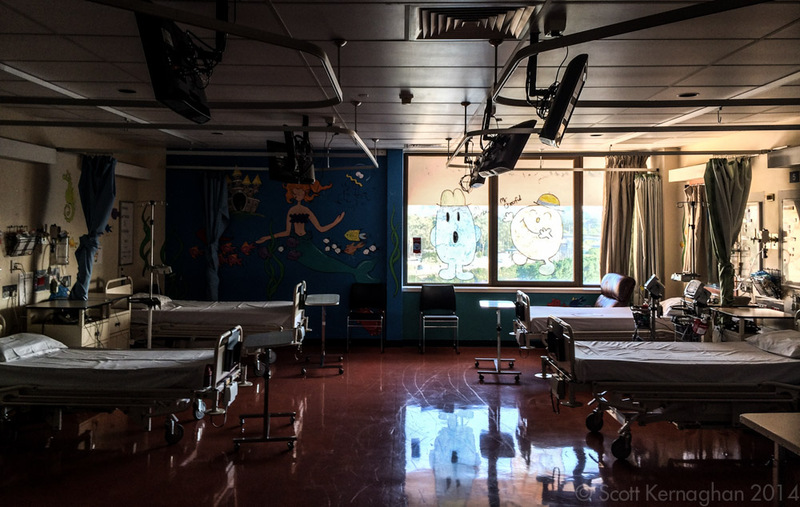 Unlike the rest of the children’s hospital, which will most likely be torn down. A lot of people see this as a sad thing, and wish that the entire site was preserved. Change is often a very sad thing to endure. Personally, I think there’s a great future to be had at the new site once the teething problems are resolved. 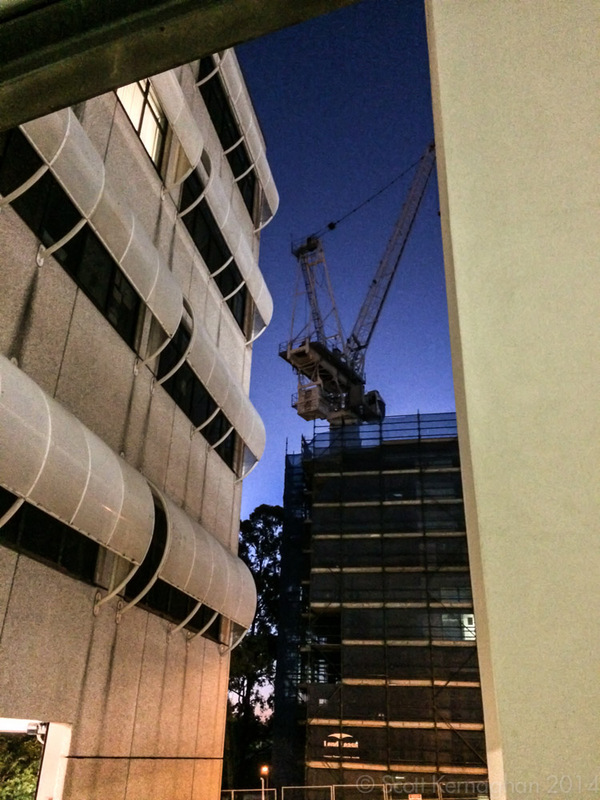 The new hospital is longer going to be known as the RCH, but rather the LCCH – a mouthful of a name that is going to be a tongue-twister for its new inhabitants. But I wish them well and all the best for the future. Now, as I move into 2015 the RCH is going to be a piece of my past that I look back on fondly. Mostly. And I’m grateful for the friends that I made when I worked there. So onwards to 2015 all! I’ll see you in the new year. ← Sherry Miss-Cast Every Juan! 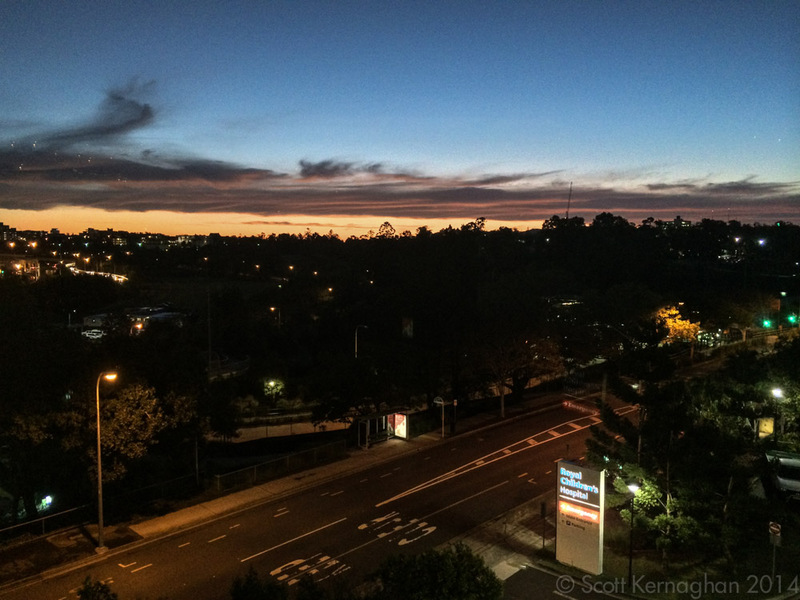 great post and pictures, scott. another nugget of brisbane history. Wonderful ! Could you contact me , if convenient? Wonderful. Please contact me , if convenient. Joyce, I’m absolutely delighted you popped by. I’ve sent an email to you. Thank you very much. LOved it as I lived in the colonial nurses quarters and worked on that campus since 1987 until I was made redundant in 2013. Hey, thanks Tracey! I do miss working with you. Lovely photos Scott & great memories for staff & patients/ families alike. Hopefully someone did the same for the old Royal Melbourne Children’s Hospital before it closed. Hmmmm I’m not sure about that. Miss Jane (mentioned above) works there now. She might be able to find out if anyone did. I’d be interested to know! Loved your article. RCH was part of my life for 12 wonderful years. Fantastic staff worked within the walls. We were more like a family than colleagues, we worked through storms, natural disasters, good and bad times always striving to achieve the best outcomes for the children and their families. Ahhhhh yes… The floods were particularly fun, weren’t they! Thank you Sharon. I loved your article and photos! 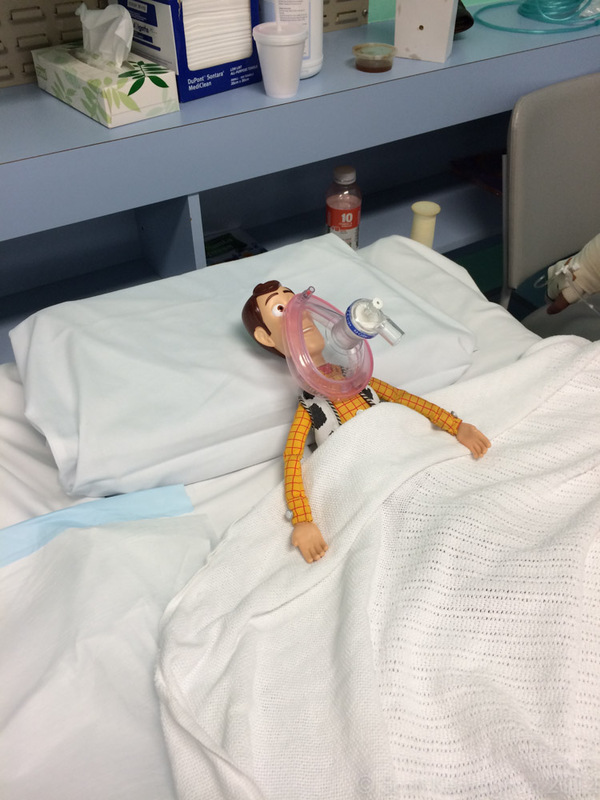 I worked at the RCH in Brisbane for six years before the transition. It was a great place to work and I have so many wonderful memories of the place. I wondered if you could possibly contact me by email please? Sure I can Robyn. Thank you for the nice comments. Sure was. Wendy I think I might know you too… I just never know anyone by their last name. It was always their first name! Agree with you Wendy. I wasn’t a nurse, but I worked with the best of them – within Nursing Administration from the early 70’s until 2000 – I am happy to say that the camaraderie amongst ALL staff was and still is beyond words, and glad that we all keep in touch, even once a year (thank you Sandy and Lennore for making contact with us) I definitely miss the RCH. Thank you too to Scott for refreshing my memories. Enjoyed reading your final farewell. I trained and worked in the old RCH and lived in the South Tower. Bitter sweet to read to read your account. Thank-you. I’ve got about 100 photos of the south tower. There’s still a fair bit of stuff in there, mostly buried in pigeon poo. The library up on the top floor next to the shower block is still there, looking very worse for wear. I bet there’s memories to be had of that place! Beautifully written article…I worked at RCH theatres and hold so many wonderful memories from my time as well as life long friends. Why thank you. Glad you enjoyed. I bet. First started working in McConnell, and often did overnight Specialling shifts in EMU with the epilepsy patients. I hope we were nice to your family! I worked at RCH from 1988-1996 and so loved it . Worked in casualty – as it was known then ! And then oncology . Such great team and fond memories . Thanks for the amazing article and photos. Brought tears to my eyes.. made many beautiful friends at the RCH when i picked up my first foster child Josh in 1996 right up to the closure… sad day for many. Thank you for all the memories. My son had complex health issues and we spent time staying at RCH in various wards wherever they could squeeze us in. Sometimes we arrived via helicopter, or ambulance transfer from RFDS or we just drove several hours to get there., We spent so much time walking around the halls pushing his stroller and an IV pole in tow, whether meandering over to the women’s hospital or just down to the front lawn to catch some sunshine. One time it was his birthday on Queensland Day and there was a horse and buggy on the front lawn and other fun activities. Antother time the Police Service was cooking a BBQ and the gas bottle leaked causing a fire so the Fire & Rescue Service came too- it was very exciting for the kids. 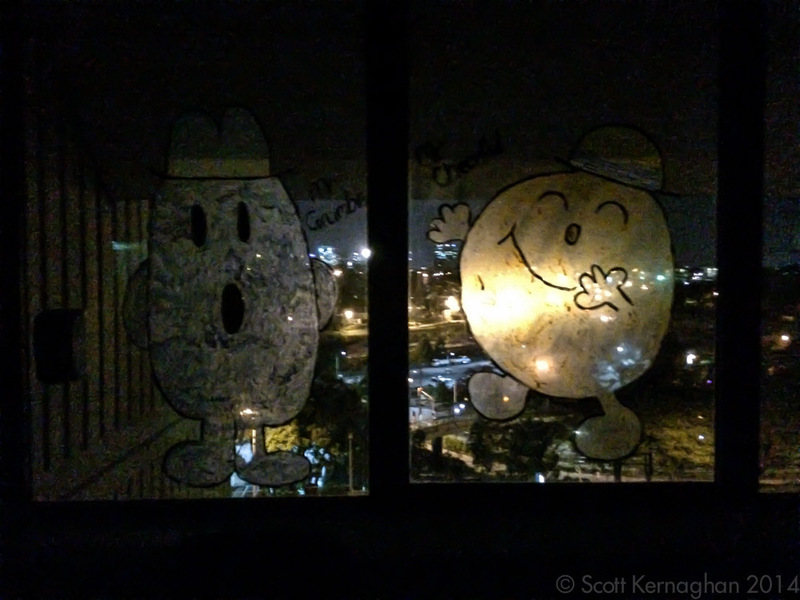 Over the years we met race car drivers, entertainers, cuddly doggies, a crocodile (person dressed up) and numerous other characters and as we explored the halls between doctor and therapist visits there was nearly always some form of renovation going on and new artwork popping up once it was done. 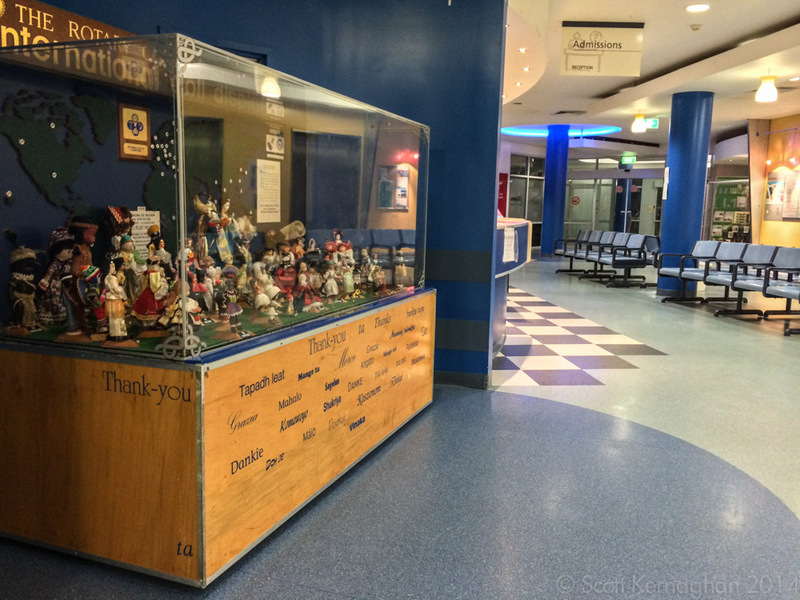 Sadly my son passed away in this hospital in Nov 2013 and other bereaved families were invited back in 2014 to contribute to a new art installation to go into LCCH. It has been completed now and is somewhere on level 2. So a piece of the old is in the new. I felt sad when the RCH was demolished, it really was a closing of the chapter. Thank you for your article all the photos, brought back many memories. I was a patient at RCH as a kid in the early to late 90’s, in fact, because I was born with some pretty severe health issues I was rushed there by ambulance back in 1987 when I was born. Just the other night I was feeling nostalgic, and researching the hospital and looking for photo’s etc and to my dismay I found it has been long closed down, and recently demolished. I was honestly heartbroken and felt very emotional. As I was searching I thought to myself that I should take a trip up to Brisbane to go check it out and have a look around and see if I could find anything that brought back memories, but now obviously, I cannot. I feel as though a part of my childhood was torn down with it. The hospital was like a second home to me, I had spent so long there that I felt very much at ease, some of my stays lasted months at a time, and I had many surgical procedures there, all the nurses knew me and adored me, and to me, hospital was kinda fun as a kid, staff really went out of their way to make it fun and as enjoyable as possible. I remember the “Play Lady” volunteers, and there would always be guests visiting like magicians and clown doctors, and I even recall once some sumo wrestlers showed up. I have some very fond memories of the place and I am extremely sad to know that it is all gone. But I wanted to say thank you for posting this, it has provided me with some comfort and solace. I do not recognise a lot of the pictures you posted, but I mean, I am going back over 20 years, I am sure there have been a few paint jobs in that time. 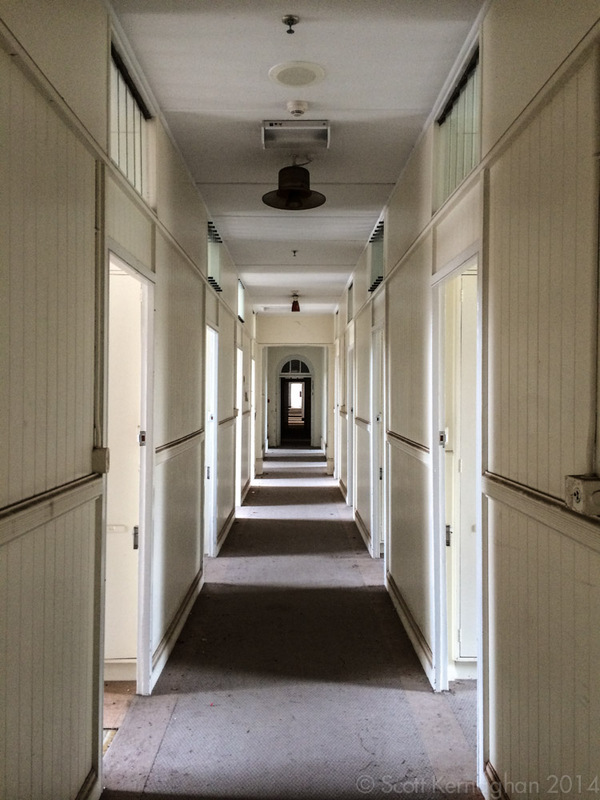 I do however recognise the exterior photos, the outside looks exactly the same, and the photo you posted of the long corridor, that was the corridor that connected the two main buildings right? I also think the onsite school was around there somewhere.